The magnetic field of the Milky Way, captured by the ESA's Planck telescope. Dark regions correspond to stronger polarization, while the stritations indicate the direction of magnetic field lines. Scientists using a European space telescope have created the best map yet of our Milky Way galaxy's magnetic field, a set of cosmic "fingerprints" that may lead to better understanding of how stars form, researchers say. 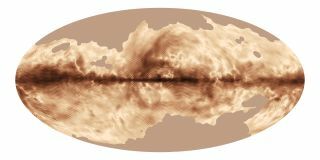 The magnetic map of the Milky Way was stitched together from observations from the European Space Agency's Planck space observatory. The Planck map shows how specially-oriented polarized light is emitted from interstellar dust. "This is the best picture we've ever had of the magnetic field of the Milky Way over such a large part of the sky," Charles Lawrence, the U.S. Planck project scientist at NASA's Jet Propulsion Laboratory in California, said in a statement. Traveling as waves in electric and magnetic fields, light vibrates in directions at right angles to one another and the direction it travels. In most cases, the fields vibrate in all directions. However, if something affects the light and causes it to vibrate preferentially in certain directions, it becomes 'polarized.' Such polarization can occur when the light bounces off a reflective surface like a mirror or the sea. Special filters can absorb polarization, which is how polarized sunglasses eliminate glare. In space, light emitted by gas, dust, and stars can be polarized. Spinning dust particles in clouds can become aligned with magnetic fields, creating polarization that can be measured. The new image from Planck reveals the large-scale organization of the polarization of the galaxy. Swirls, loops, and arcs, like giant fingerprints, trace the structure of the magnetic fields in the Milky Way, which results from the field lines running predominantly parallel to the galactic plane. Darker regions correspond to stronger polarization, with striations indicating the direction of the magnetic field on the plane of the sky. The image also reveals variations in polarization by nearby objects, such as clouds of gas and dust. These variations are revealed by tangled features above and below the plane, where the local magnetic field is especially disorganized. Planck's study of the galactic polarization is analyzed in four papers recently submitted to the journal Astronomy & Astrophysics. More data based on Planck's observation of polarized light covering the sky at seven frequencies will be released later this year. Although the Planck space observatory shut down in 2013 after running out of coolant, researchers continue to study the wealth of data it collected. The Planck space observatory launched into space in May 2009. In addition to studying the magnetic structure of the Milky Way, the craft also collected information on the cosmic microwave background, light from the early universe.